Title: תַּנַ”ךְ‎ : The Holy Scriptures of the Old Testament, The Tanakh, with Hebrew and English parallel text. Condition: Hardcover, full leather. Good overall – expected rubbing and wear, but clean and tightly bound. Exceptionally scarce. Please note that this book is absolutely enormous and will cost extra to ship overseas. This book opens from left to right, and contains the entire Masoretic text of the Bible. It contains The Torah (“Teaching”, also known as the Five Books of Moses), Nevi’im (“Prophets”) and Ketuvim (“Writings”), all arranged according to the Hebrew tradition, and with the Authorised Version of the translation on the same page. 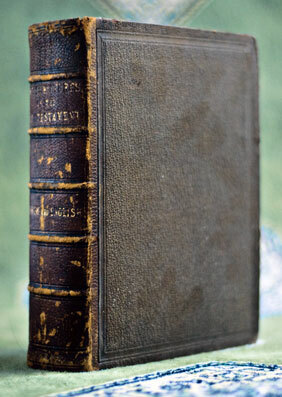 It also contains an extensive index and notes, all in Latin. According to Jewish tradition, the Tanakh consists of twenty-four books. The Tanakh counts as one book each Samuel, Kings, Chronicles and Ezra-Nehemiah and counts Trei Asar (תרי עשר, the Twelve Prophets; literally “twelve”) as a single book. The Torah (תּוֹרָה, literally “teaching”) consists of five books, commonly referred to as the “Five Books of Moses”. 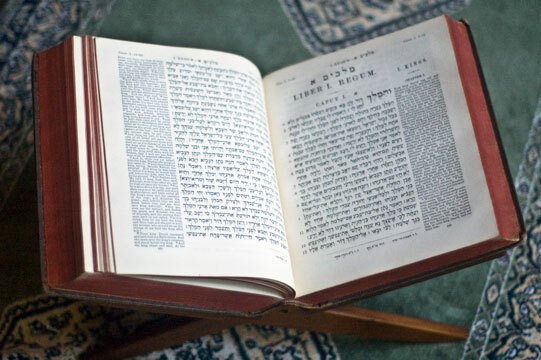 Printed versions of the Torah are often called Chamisha Chumshei Torah (חמישה חומשי תורה, literally the “five five-sections of the Torah”), and informally a Chumash. Nevi’im (נְבִיאִים, “Prophets”) consists of eight books. This division includes the books which, as a whole, cover the chronological era from the entrance of the Israelites into the Land until the Babylonian captivity of Judah (the “period of prophecy”). However, they exclude Chronicles, which covers the same period. The Nevi’im are often divided into the Earlier Prophets (נביאים ראשונים), which are generally historical in nature, and the Later Prophets (נביאים אחרונים), which contain more exhortational prophecies. Ketuvim (כְּתוּבִים, “Writings”) are sometimes also known by the Greek title “Hagiographa” and consists of eleven books. These encompass all the remaining books, and include the Five Megillot (Five Scrolls). They are sometimes also divided into such categories as Sifrei Emet (ספרי אמת, literally “Books of Truth”) of Psalms, Proverbs and Job (the Hebrew names of these three books form the Hebrew word for “truth” as an acrostic, and all three books have unique cantillation marks), the “wisdom books” of Job, Ecclesiastes, and Proverbs, the “poetry books” of Psalms, Lamentations and Song of Songs, and the “historical books” of Ezra-Nehemiah and Chronicles. Although most versions of the Old Testament count the number of books as totaling thirteen, counting Ezra and Nehemiah as two books and I and II Chronicles as two, Jewish Tradition again does not.